If you did not think to look for it, you would never know that this church was there. 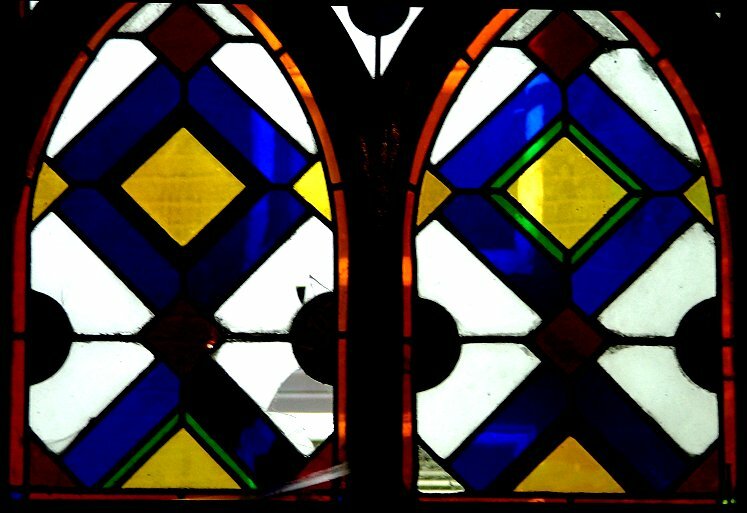 Not only is it surrounded on all four sides by shops and offices, but it fell out of use in 1544, and has not been in the care of any mainstream denomination since. 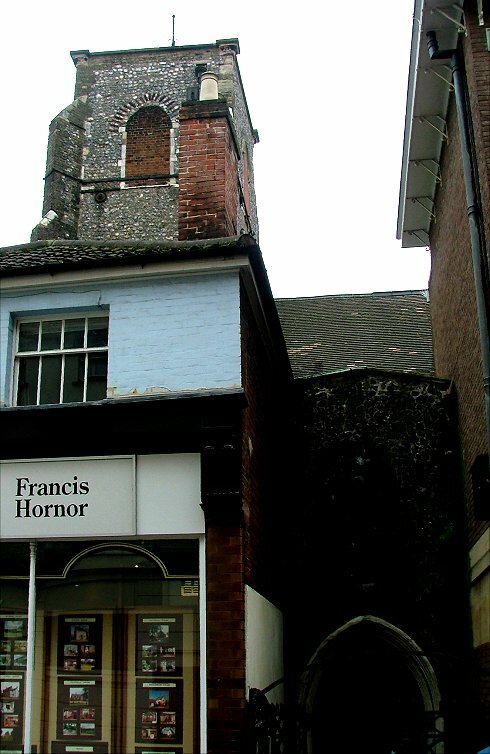 Only the tower is visible, peeping above Queen Street, and then suddenly between two estate agents there is the squeezed, two storey 14th century porch. A gateway to the north-west corner of the graveyard was restored in 1999 and can be found around the corner in Tombland between another estate agent and a pizza restaurant, but otherwise you would never know that this little 13th century church was there at all. There have been occasional sightings of this rare beast. In 1958, a row of shops in Queen Street were demolished to make way for new buildings, and suddenly the vista to the left was opened up, for George Plunkett to photograph. 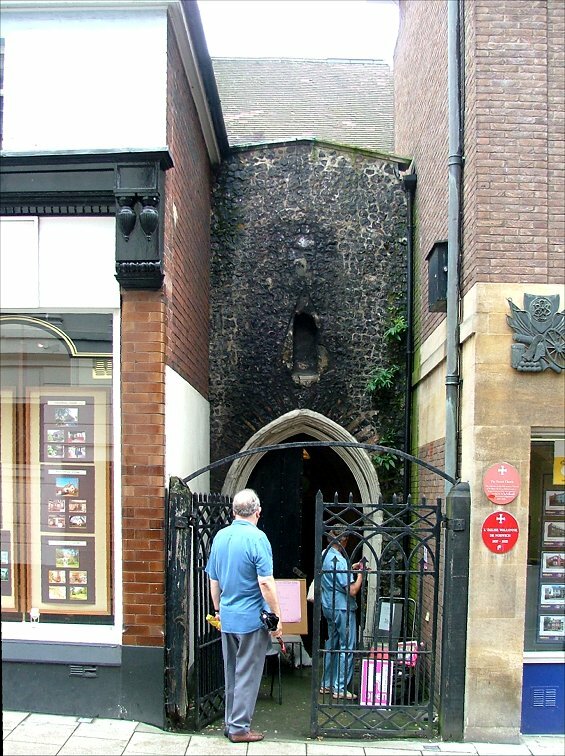 It was as if Norwich had gained a new medieval church; and, within a few months, it was gone again. It would not have been unusual before the 19th century to find a church completely surrounded by shops and houses - indeed, Norwich's second biggest church, St Andrew, was like this into the 20th century. And several town churches found new functions after the Reformation. But St Mary the Less so convincingly fell from sight that it almost disappeared altogether. 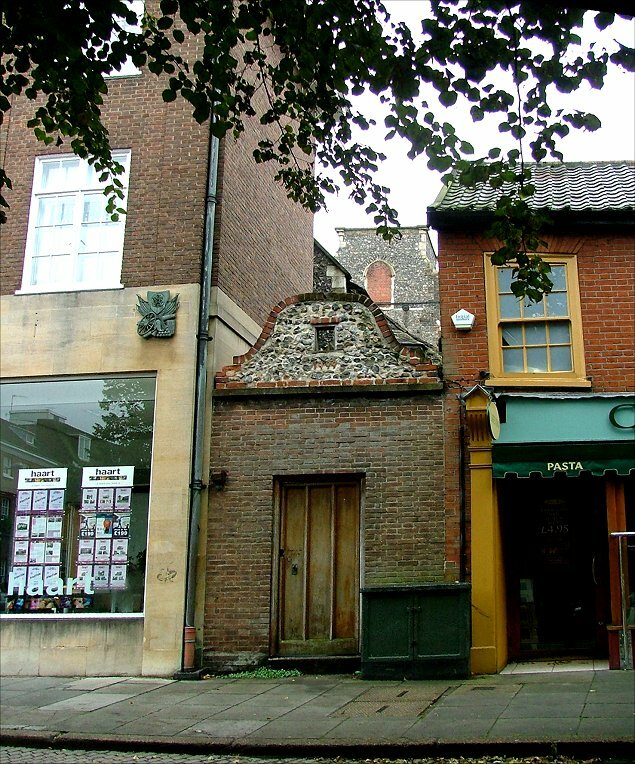 On its redundancy in the 16th century, it was sold to Norwich Corporation, and became a merchant hall where Dutch and Walloon merchants sold their cloth. This continued until the 1620s, when falling demand meant that the Corporation rented it out to the local Worsted merchants, who used it for a while. 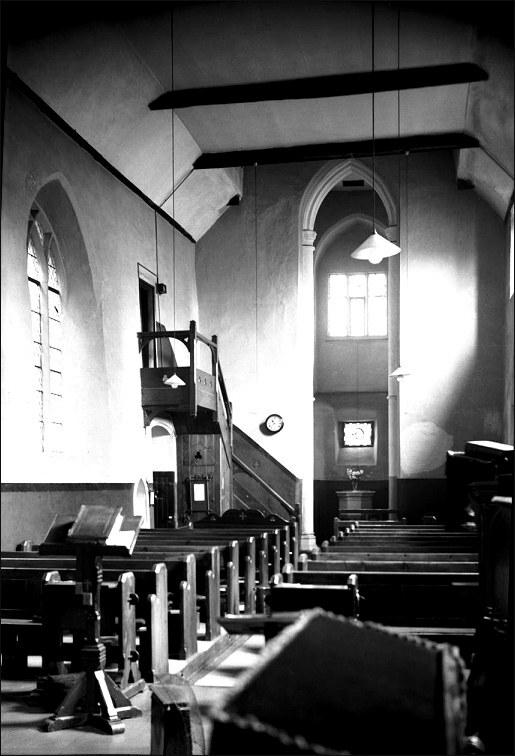 In 1637 it was bought by the Flemish Walloon Company to be converted into a French Protestant church. 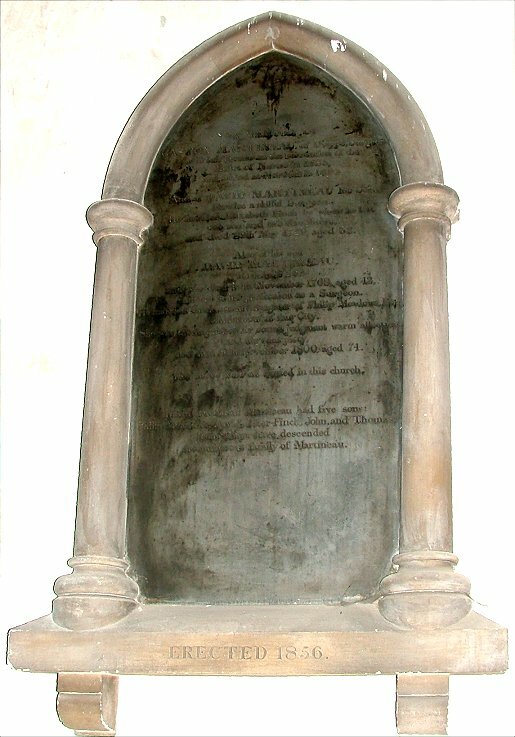 Among the famous members of the congregation were the Martineau family, who are commemorated by several plaques. 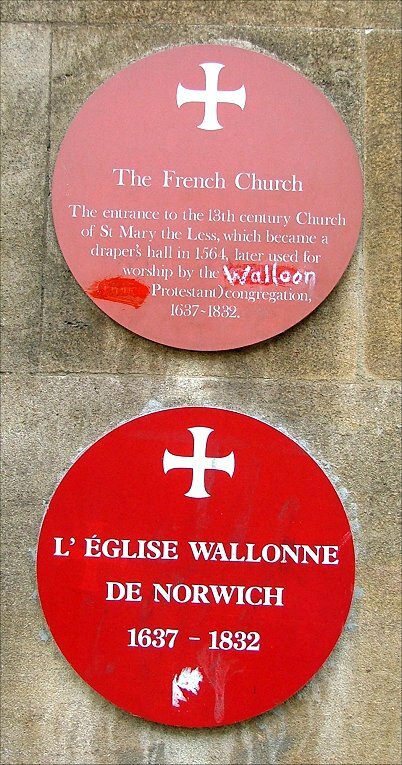 The difference between Walloons and Hugenots is one of region rather than belief, but the Norwich heritage trail plaque that refered to this as the 'Hugenot church' has been vandalised, presumably by Flemish nationalists, and altered to read 'Walloon church'. 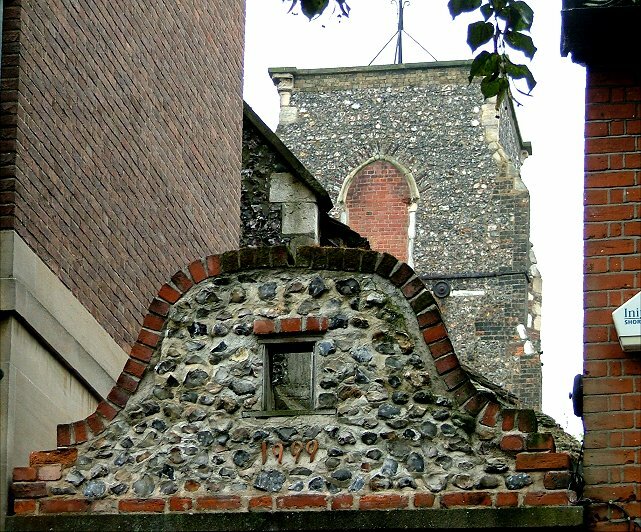 By 1832, the French Protestant community had been fairly fully integrated into Norwich non-conformist life, and the lease was sold to the Swedenborgians. 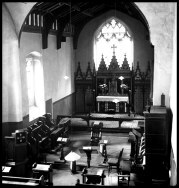 This protestant cult flourished briefly in the mid-19th century before fading, and, as a consequence, the lease passed in 1869 to one of the most astonishing denominations ever to arise on English soil, the Catholic Apostolic Church, or the Irvingites, as they were known after their founder. The Church was bankrolled by fabulously wealthy aristocrats, and in several towns and cities they built churches on a Cathedral scale, including the magnificent Church of Christ the King in London's Gordon Square. 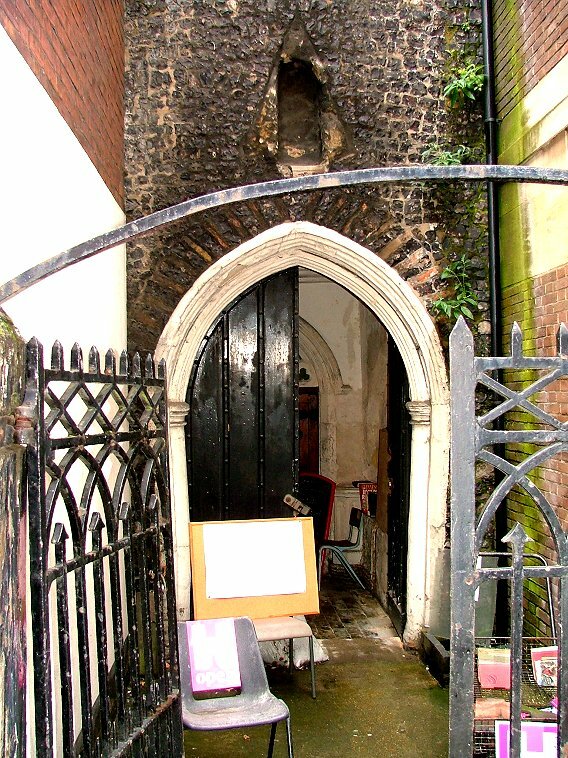 The fact that they leased a church rather than building one in Norwich suggests perhaps that Norfolkers were rather less than overwhelmed by Irving's fusion of high church ritual with madcap theology. 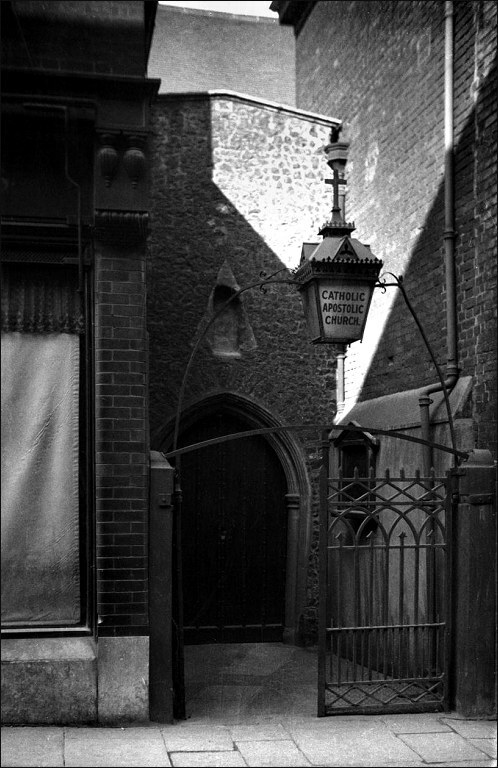 A lamp with their name on hung above the Queen Street entrance for George Plunkett to photograph in 1937. 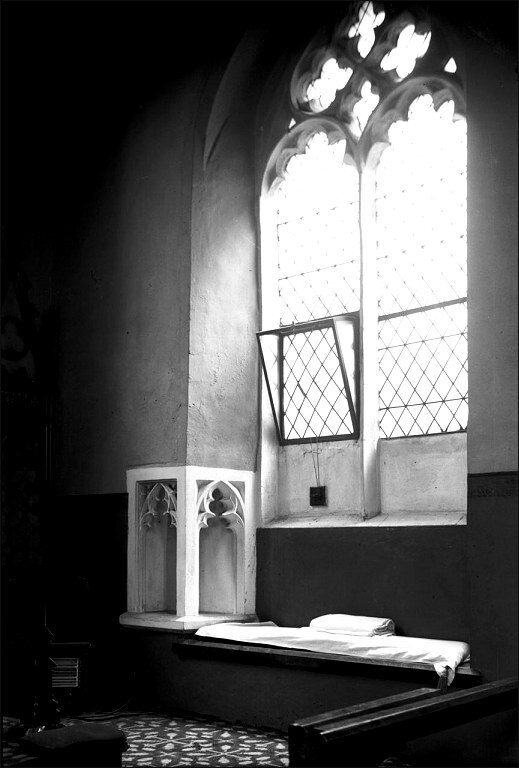 He also took some images of the inside, rare surviving evidence of the liturgical arrangements of this curious denomination. 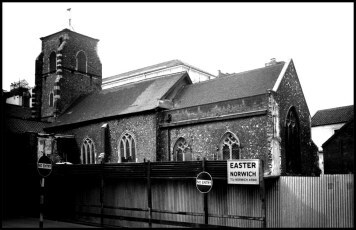 Incredibly, for what was essentially a bizarre Victorian spiritual fancy, the Catholic Apostolic Church here lasted into the 1950s, when the last of the Norwich congregation died off. The building then became a furniture store. 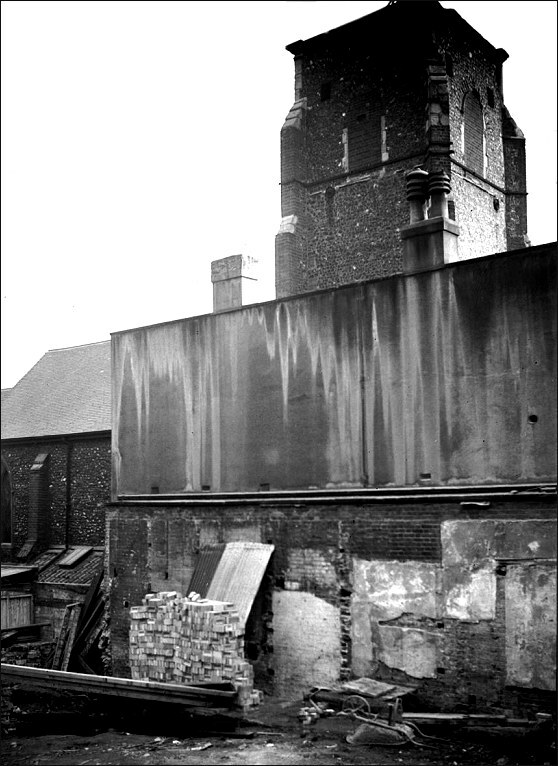 A builder's yard to the north of the church provided a vista in the interwar years, but this was all built up in the 1950s. 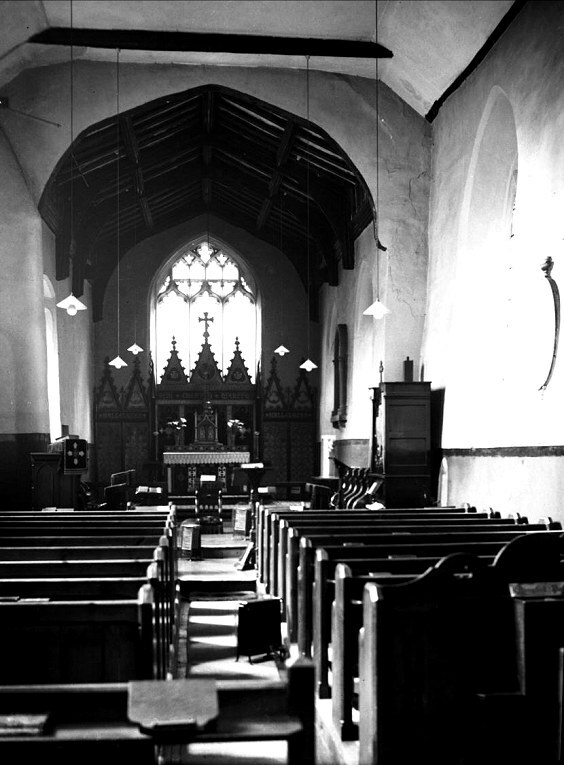 When I first visited here in the mid-1990s, the church had just been sold by the same trust which, amazingly, had been formed in 1832 to convey ownership of the lease to the Swedenborgians. The building was bought by a curious organisation which proclaimed itself 'the Dutch and Flemish studies centre' . At first, I thought that they must be something to do with the University, and the people I spoke to at the time did not deny this, but I do not think that it was so. 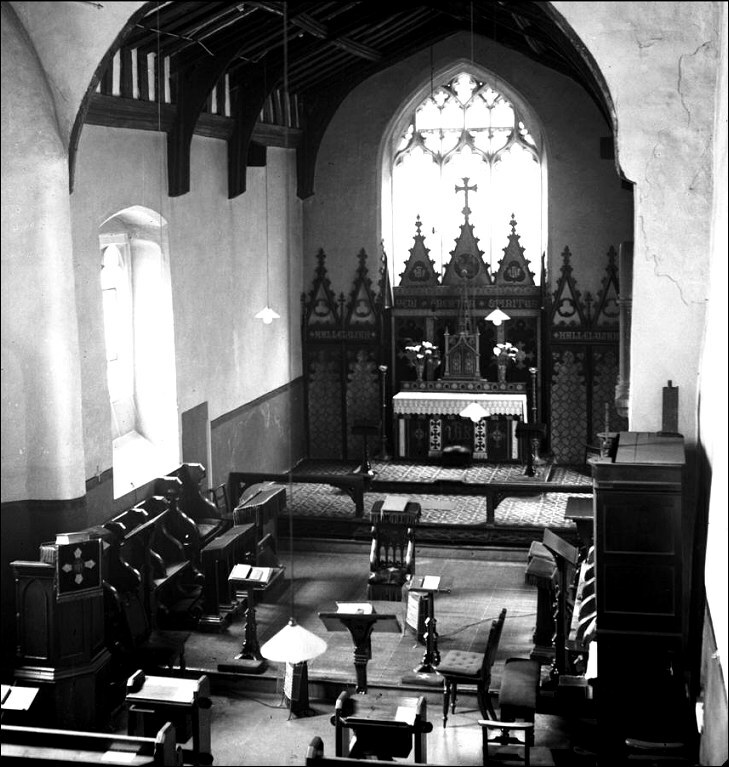 The church was just a bare shell then, and I came back ten years later expecting to find a brave modernisation with a library, lecture room and a study centre. This was not the case at all. 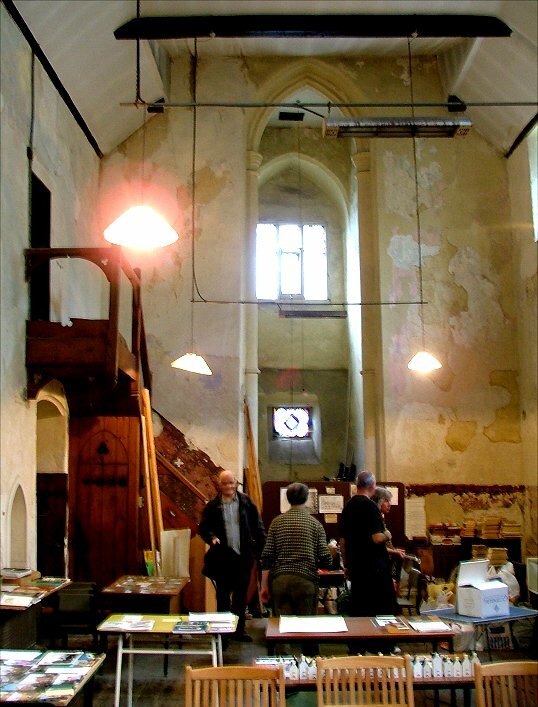 Stepping into the south porch, and then into the church, I found that the building is little different to how it had been a decade before, except possibly damper and dingier. There has been no refurbishment at all. 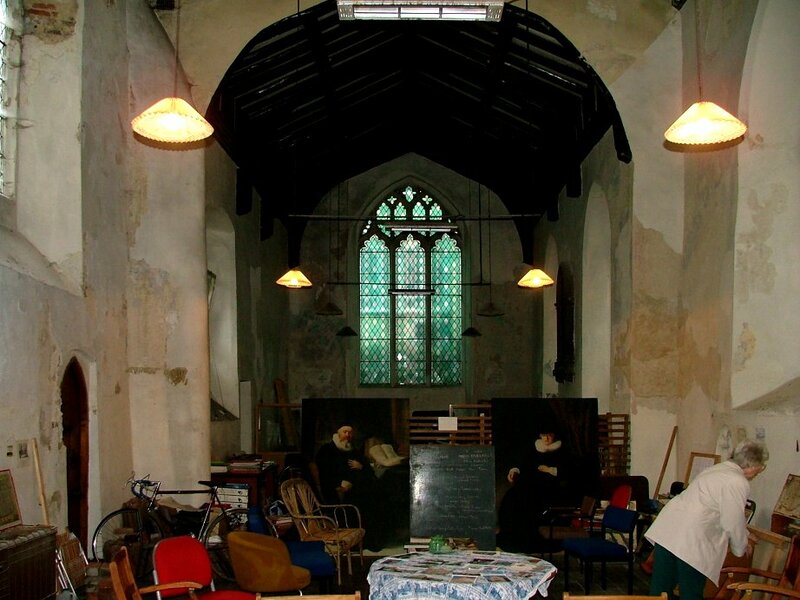 It is also a lot more cluttered, mainly full of display cases about the history of the Walloon community in Norwich. There are a couple of interesting details inside. The tower arch is extraordinary, a a narrow, tall affair that reaches right to the roof. 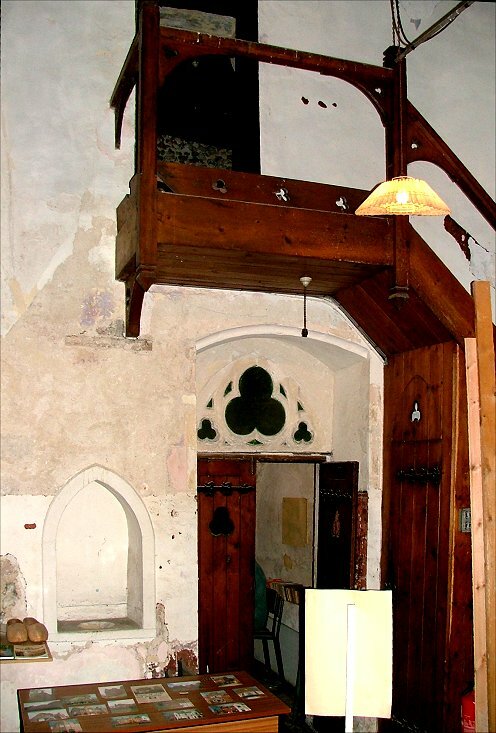 The staircase that leads to the room over the porch dates from the use of the building by the Catholic Apostolic Church, as does the coloured glass in the north door. 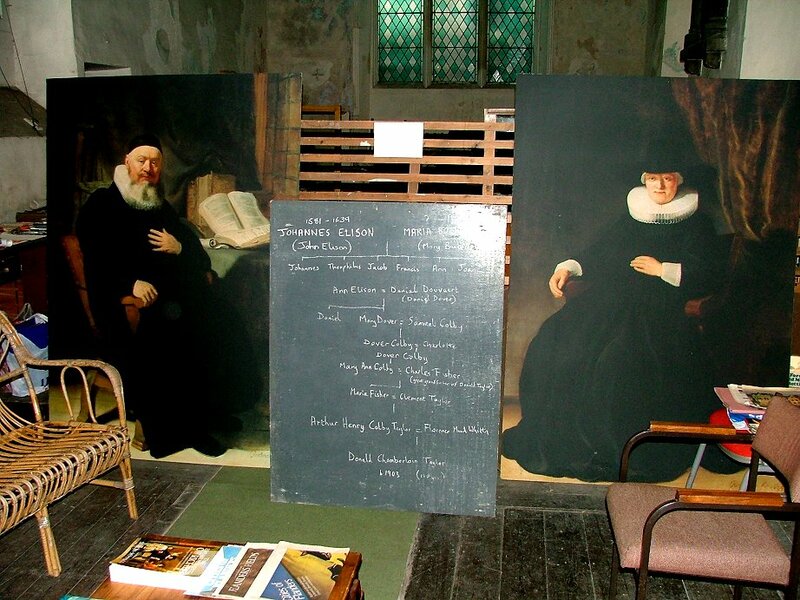 Two large portraits of dour Dutch protestants block the way into the chancel - a statement of religious belief if ever there was one.